If you have access to natural gas in your neighborhood, a natural gas garage heater can be a great choice. It burns clean with no soot or residue, and most of them are very energy efficient. Natural gas is generally more economical than electric heat in the long run, even though the up front cost is higher. Natural gas has several advantages over propane heat. For one, you don't have to worry about running out or scheduling tank refills like propane. It is considered to be safer than propane, too. Natural gas is lighter than air, so it rises and will not "pool" on the floor in the event of a leak like propane will. The ignition point is also a couple hundred degrees (Fahrenheit) higher than propane. Many natural gas garage heaters can also be made to run on propane, so there are a lot of similarities between them. Natural gas units can be ventless or vented, and can provide convection heat or radiant heat. Ventless heaters use the air from inside the garage for combustion, and the combustion byproducts are released into the garage. This type requires that the space be well ventilated. Gravity vented heaters also use inside air for combustion, but they have an exhaust duct to vent the combustion fumes outside. Power vented heaters work the same way, but they have a fan in the exhaust to help push the combustion fumes out. The best and safest type is the separated combustion heater. This type pulls in outdoor air for combustion, and also uses a fan to push the exhaust fumes outside. Some of the more efficient models have the air intake routed inside of the exhaust duct to preheat the intake air for better combustion. 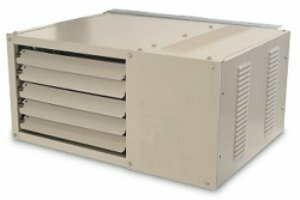 A convection type heater warms the space by blowing air across a heat exchanger. The heat exchanger warms the air, and the fan circulates the warm air throughout the room. This is the best type for warming the entire garage evenly, and it is the most common type of gas garage heater. However, the fan stirs up dust and makes noise. You also can lose most of your heat if you open the garage door to move a car in or out. With convection heat, much of the warmth also ends up at the ceiling instead of down near the floor where it is needed most. A radiant type heater works off of the same principle as the sun. It produces infrared light which warms the objects (and people!) in the garage instead of warming the air. This type is more energy efficient than a convection heater. It is relatively silent, and does not stir up dust with a fan. Since the objects in the garage are warmed, you don't lose as much heat when you open a garage door as you do with a convection heater. You also will feel the warmth even when the air temperature is still cool, just like sitting in the sun on a cool day. There are two basic types of radiant heater: high-intensity (or luminous), and low-intensity (tube type). The high-intensity type has visible flames and is typically unvented. The low-intensity type has the flame totally enclosed in a tube and is usually vented outside the building. The low intensity tube-type heater is generally safer in a garage environment that is likely to have flammable vapors present. Radiant heat does have some drawbacks, though. It only warms objects that are in the direct path of the heater, and if you are working in an area that is "shaded" from the heater you will not feel as warm. The further away you are from the heater, the less effective it is, also. It can take a little while for a radiant heater to warm up the entire garage, although you will feel the heat pretty quickly if you are close to it and not shaded from it. Natural gas heaters overall have a few disadvantages compared to electric or propane heat. The first disadvantage is that natural gas is not available everywhere. Propane or electric units are more popular in rural areas for this reason. Both types of gas garage heaters (natural and propane) require more maintenance than electric garage heaters, and are more expensive to purchase. A natural gas heater also requires a permanent installation. You cannot pick the heater up and take it with you like you can with some of the electric or propane heaters. However, if you have access to natural gas and you use the garage a lot during the winter, a natural gas heater is likely to be one of the most economical choices in the long run. (You may also want to check out the menu of our Related Pages for information on other types of heaters.) There are a number of different options available for a natural gas garage heater, so it should be easy to find one that suits your needs.